Imagine my excitement as I walked through the Capitol Theater in Salt Lake City after seeing "Legally Blonde," and heard my hunkalicious date say, "I just saw your picture back there." We were strolling along the main lobby area everyone has to pass through to get into the theater. I couldn't figure out what sort of a joke he was cracking with his nonchalant tone as if you pass your own photo in a ritzy theater every day. Then the thought hit me, "Oh! 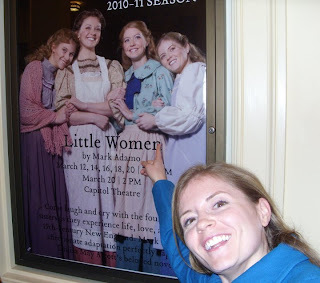 I wonder if the Utah Opera publicity photos are up here?" such a hot little amy!! It is you! You are a little woman. Wow! And what is with there being two of you in the poster? That girl looks like your twin! We saw that poster too and meant to ask you about it. So when is Little Women playing? Ok, nevermind. I followed your linked and found out we've already missed it. Too bad.